It has been a while since my last update. For the last month, I stayed in a hostel that was not conducive to work. The place was under construction and there were no quiet places. That, and I fell seriously ill twice while staying there. I’ve since moved to another area of the city, Coyoacan, where I can be closer to, uh, closer to someone special that you’ll meet in an update or two. I spent the first two nights recovering here in a hotel from an illness Felix is calling “Mexibola.” I am now in a quaint little hostel where I can finally get some work done. 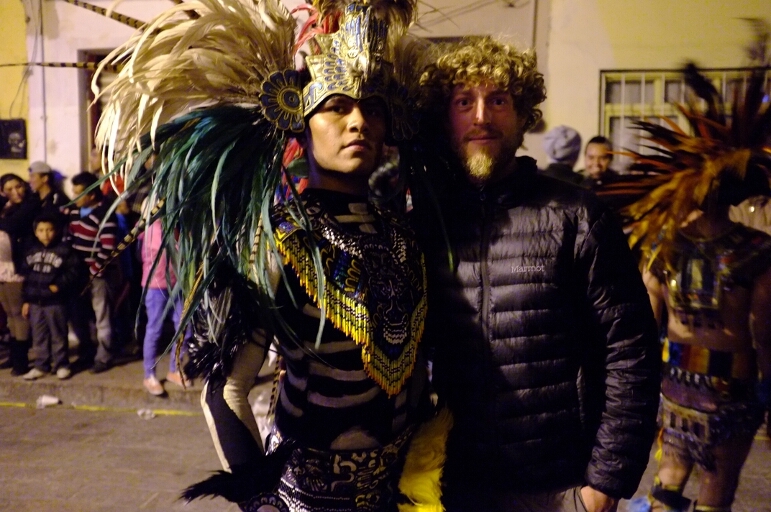 The following story takes place five weeks ago in the city of Queretaro where I was invited to stay with the family of a friend I made in a hostel in Durango. I cannot thank them enough for all they have done for me. I really felt like part of the family. 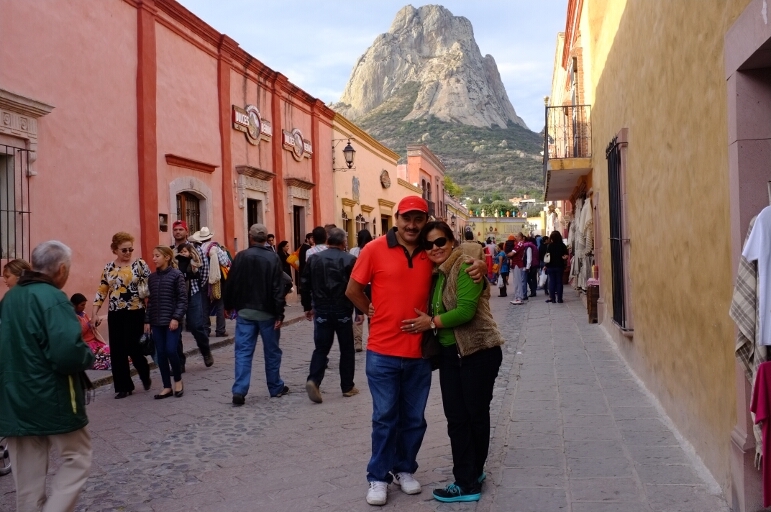 Arturo’s Mom and Dad standing before the worlds third largest monolith. A young man stands with a rock in his hand. His arm raises. He takes aim. His arm extends behind his head and he throws the egg-sized rock. The rock sails over the long wooden table and passed the woman working the carnival game. A glass bottle on the middle board shatters as the rock finds its mark. The young man and his group of friends cheer. “Ahhhh!!! !” His friends slap his back in congratulations. The victor looks at the middle-aged worker standing across the table then at the cute young women with jet black hair standing beside him. They are both short but she is shorter; her head raising only to his shoulders. She points at a stuffed animal hanging along the side of the timber-framed booth. A pink elephant. The worker removes it from the hook and passes it across the wooden table. “Your country has soo much character!” I say to my friend Arturo. “We have the same carnival games in the states only yours are all made by hand.” I am grinning from ear to ear. A laugh erupts from the depths of Arturo’s chest. “Lets get a beer. The show has started.” We buy caguamas, 40oz bottles of beer, and make our way to the stage. “There are so many people here!” Luckily, Mexicans are short. I can see clear over the heads of the entire crowd. A few minutes later I stood sandwiched between a metal fence retaining the press of a thousand eager fans and a stage enclosed in metal towers blazing colored lights on four performers below. I am backstage with the princess and president of a tiny town for the biggest show of the year. 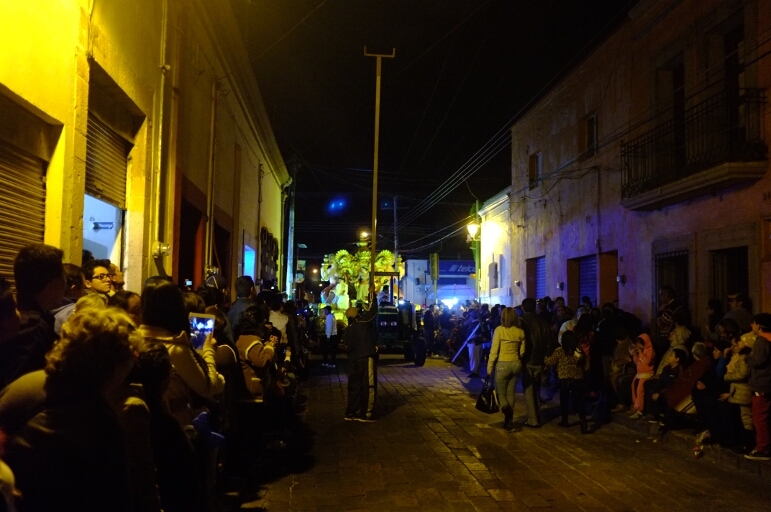 Under the brilliant lights of the main-stage, men in suits of silver and purple emblazoned with the title, “Calibre 50” dance about with instruments rarely seen in the United States. The leader singer works red and black baffles of an accordion. Also singing, a guitarist strums an elaborately designed black guitar. A tuba spiraling around a purple vest is pressed to the puckered lips of another member of the band. Behind them all on a raised platform, whorl the drumsticks of the drummer. The only picture I have of my friend. I was so swept away I forgot to take pictures. Yesterday was incredible as well. 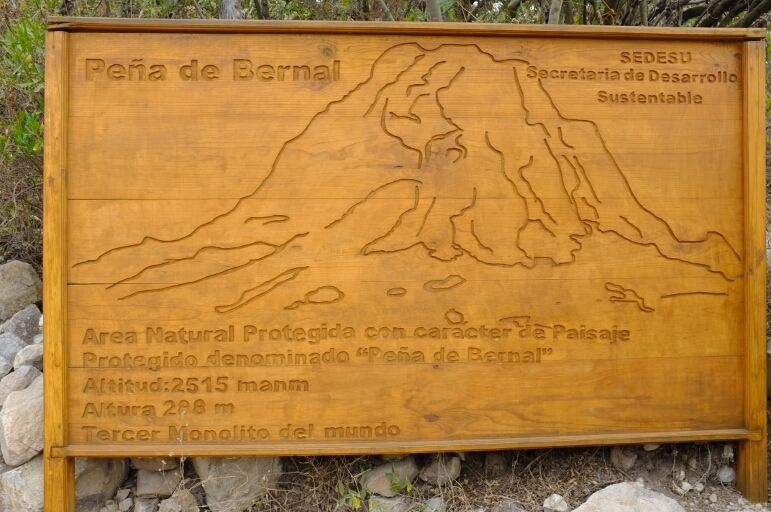 While my friend worked, his parents drove me to Pena de Bernal, the third largest monolith in the world. For those who don’t know, a monolith is basically a massive rock. 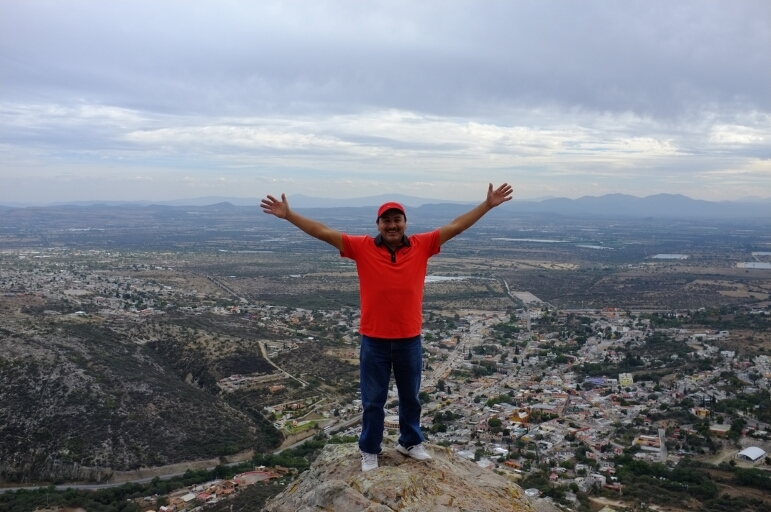 The size of a mountain, Pena de Bernal juts out of the ground and stands sentinel for the small pueblo beneath it. “Uh, sure.” I say staring at green cubes of cactus sitting inside a larger cactus, the size of my torso, that they were cooked in. “Tres, por favor.” Her mother orders the food. 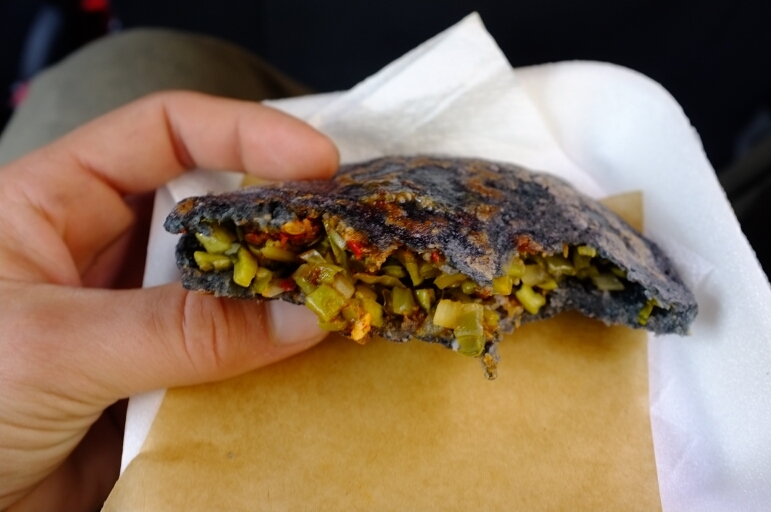 A tiny brown-skinned indigenous women scoops cubes of cactus with a wooden spoon and deposits them inside a tortilla of blue corn. She fries it on a round wood burning stove. We continue walking up the steep and narrow stone roadway. Both sides are lined with shops selling artisanal items; fancy stones, jewelry of leather and cloth, toys of wood, carvings of glass and stone and wood. “Have you had caguamas yet?” This is my introduction to caguamas. Here, caguamas are fancy. 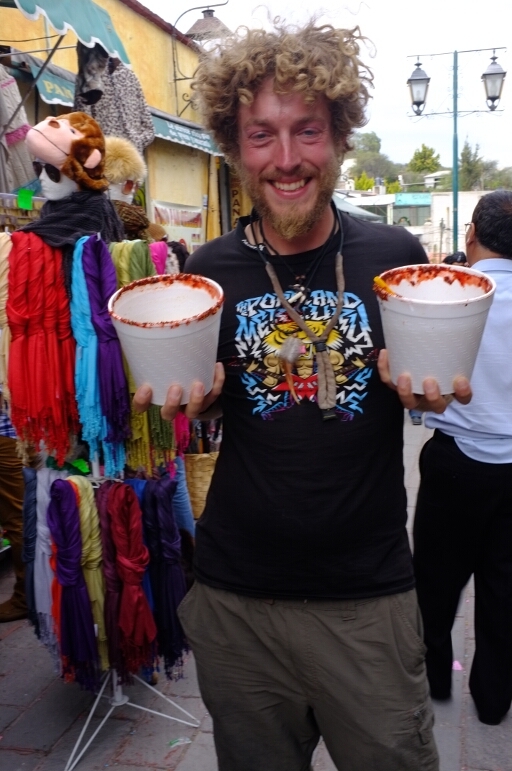 40oz bottles of mexican beer are inverted over styrofoam cups as big as my head. Limes are cut and placed in hand-held juices. Squeezed, the juice flows into the cup mixing with the beer. Multiple limes find their way into the cup. 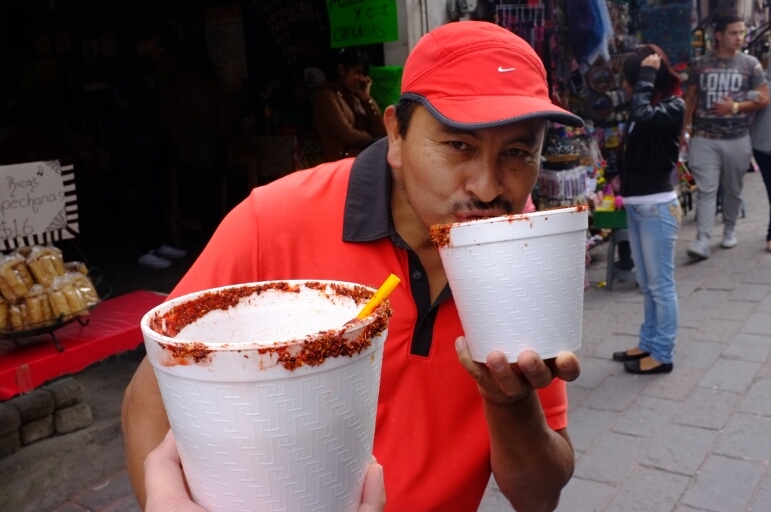 The rim of the cup is then lined with chewy and spicy candied chile. We take our beer and head for the trail head. “No cervesa.” Says the guard blocking the trail head. Arturo’s dad negotiates to no avail. “Bottoms up!” We chug the contents of giant cups. The climb up the monolith is steep and treacherous. There are railings in only two places. Most likely, where the most accidents occur. 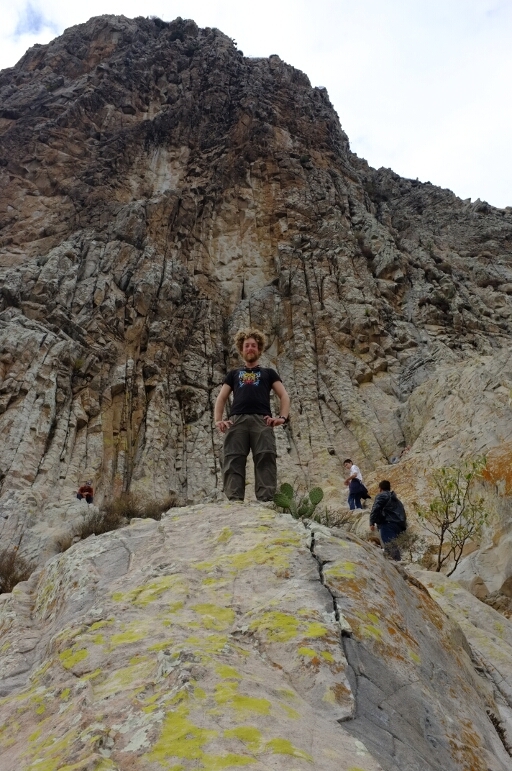 Most of the climb is a four-legged scramble up rock and over boulder. The ascent became more interesting when 40oz of beer found its way into my bloodstream. 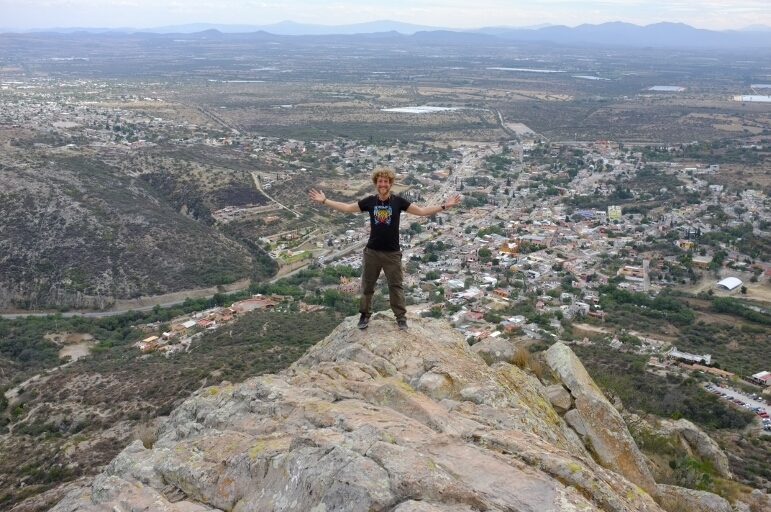 Reaching the top, at least as far as we could climb without ropes, we posed on the furthest rock outcropping overlooking the pueblo below. Arturo’s dad buys a beer from a group of kids with a cooler; thirsty after the difficult climb. We safely descend and find Arturo’s mom. 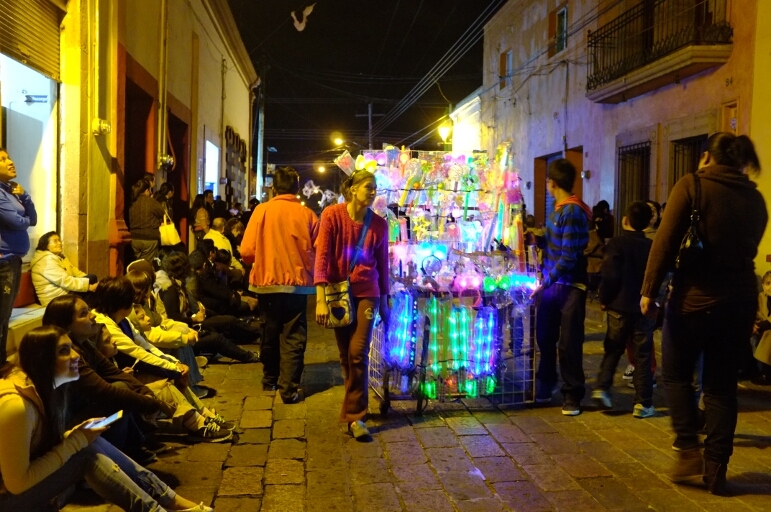 We walk down the stone streets through the maze of vendors. A leather-bound journal catches my eye. I’ve been searching for months. “He rode here from Canada on a bicycle.” His mom, in Spanish, tells the indigenous couple behind the counter. I walk around the row of booths and enter the timber structure through a tiny door. I am careful not to hit my head. 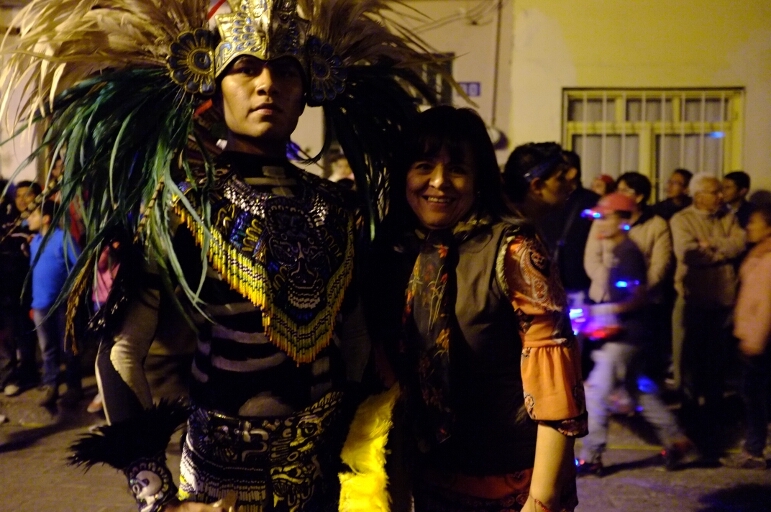 A young man and women stand before me dressed in handmade clothes mostly of leather. They have long jet black hair. The man strikes a match to something contained in a metal tin and suspended from a chain. It begins to smoke. Saying a prayer in a language I don’t understand, he begins to swing the metal tin around my body. His tone is serious. His eyes are distant, someplace else. With a higher power? Smoke fills my lungs. He sets the tin aside. I am told to close my eyes. I close them. I feel him standing close. A moment later comes a sound; deep and eerie. A conch shell. The sound reverberates through my body. It is moving and surrounds me. I feel it in my bones. Moments pass. All is quiet. Then, the sound of a drum. A deep, deep sound. More of a gong. I feel it in the very depths of my soul. It fills my lungs. It becomes almost hard to breathe. I am entirely immersed in the moment. The gong stops. I am told to open my eyes. The man with long black hair and leather clothes decorated in the adornments of his people is standing before me staring through my eyes and into my soul. “Hold out your hand.” I extend my hand as instructed. I attempt to shake his. “No,” he says. “Like this.” He closes his fingers around my wrist. I close mine around his. I am asked to extend my hand again. He presses something into my palm and closes my fingers around it. A dream catcher on a necklace with two red-tipped feathers dangling below. “Thank you so very much,” I say nearly speechless. I stoop back through the tiny door wearing my new charm. 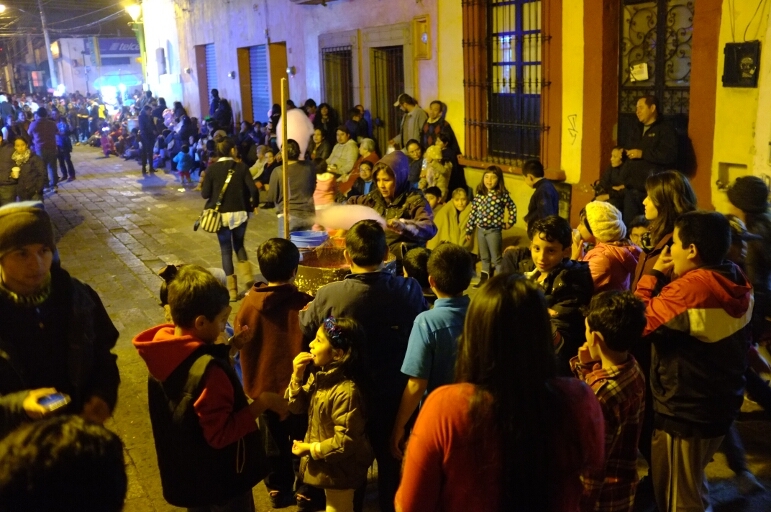 My last night in Queretaro with this fabulous family was spent watching a Christmas parade. 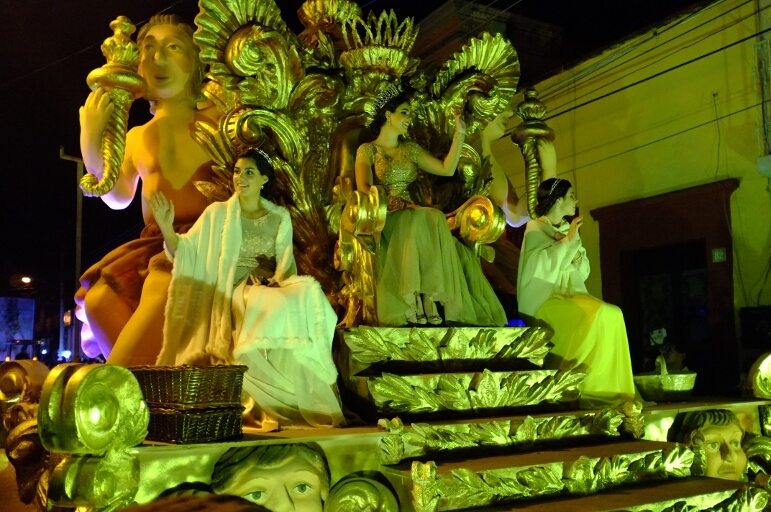 The annual procession has an annual theme. This years theme is music. Floats float passed filled with singers serenading women on balconies. Floats float passed with large people singing opera. Floats float passed filled with singing monks. A floats float passed ripping down power lines. 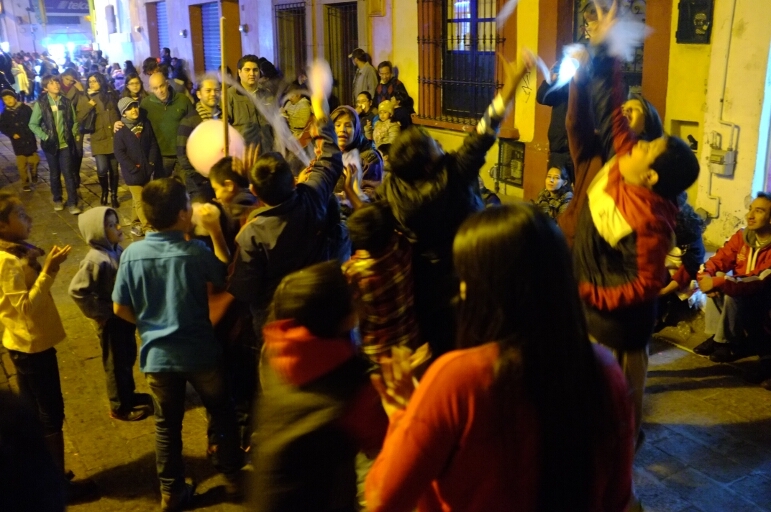 Little surprises me in Mexico these days, but kids running around with long metal poles pushing up power lines certainly did. That no one was electrocuted surprised me even more. A long metal pole used to hold up power lines. One of these will be ripped off a wall shortly. Dancers often pass behind the floats. Arturo’s mom posses with one. 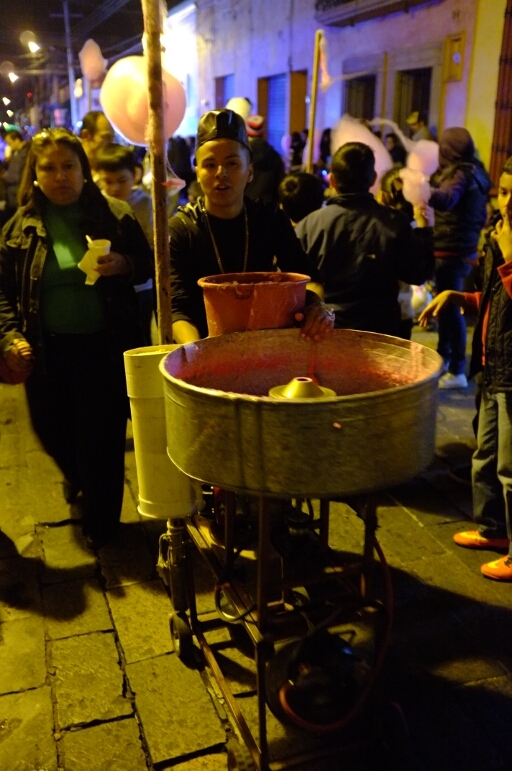 Cotton candy machines are pushed through the streets with lines of children following. They are there not to purchase but for the free samples. As the machine works, free samples float through the sky sending children and grown-ups alike jumping for sugar. The propane powered cotton candy machine. 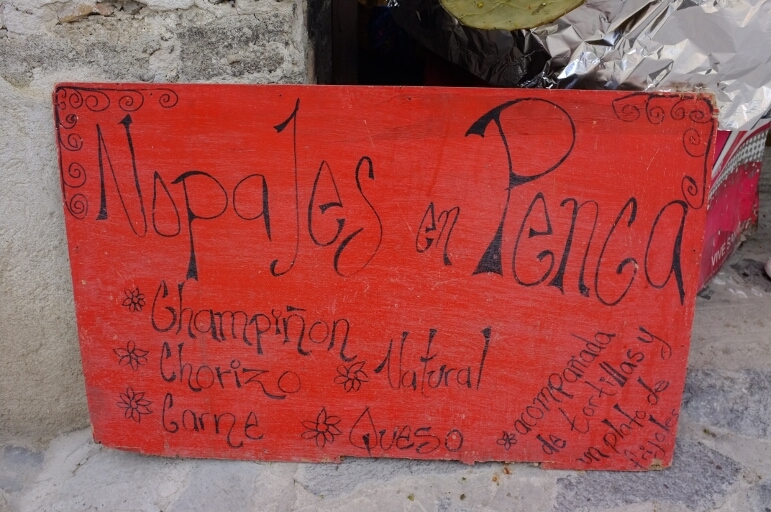 Families are very close in Mexico. Inside the cage of this cart sitting on the bottom, are two small children. 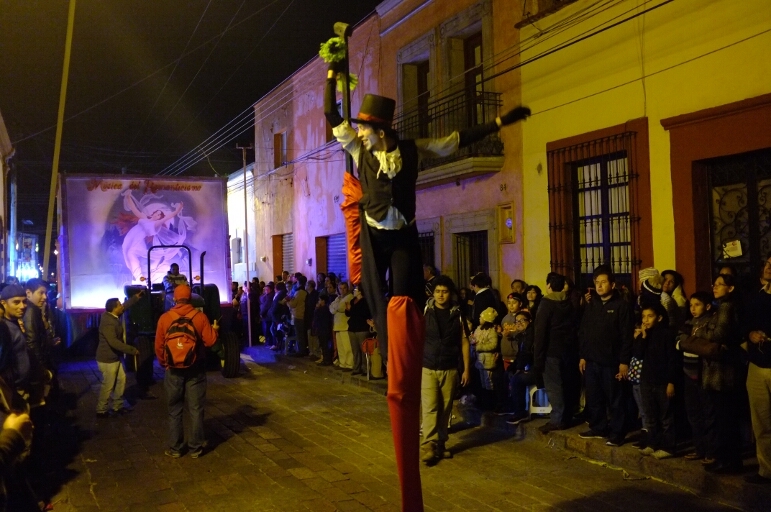 Circus performers on stilts dance through the streets performing unbelievable feats. 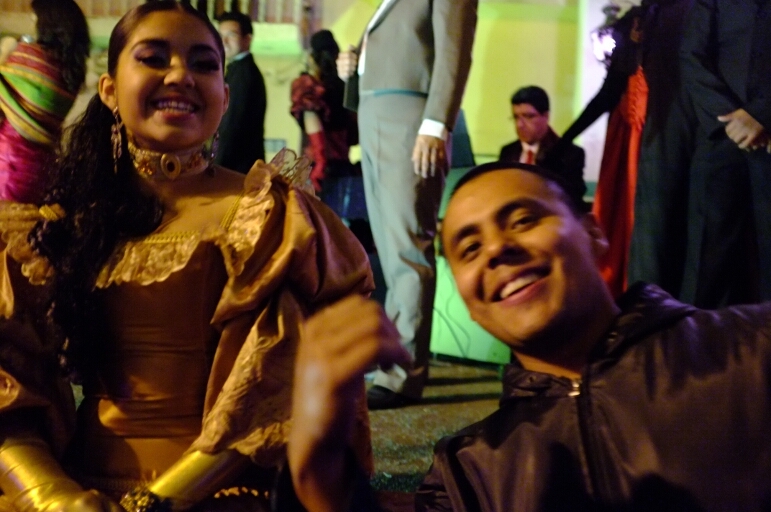 Arturo’s dad fondling a stilted figure. 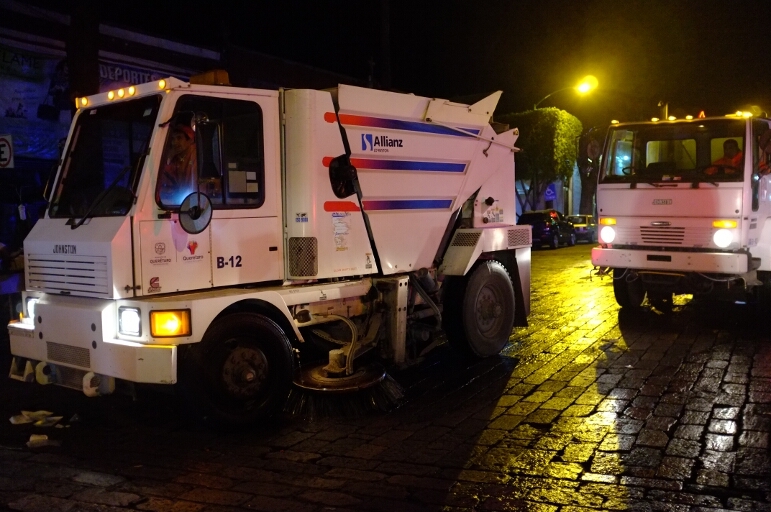 The clean-up crew follows closely behind the procession. 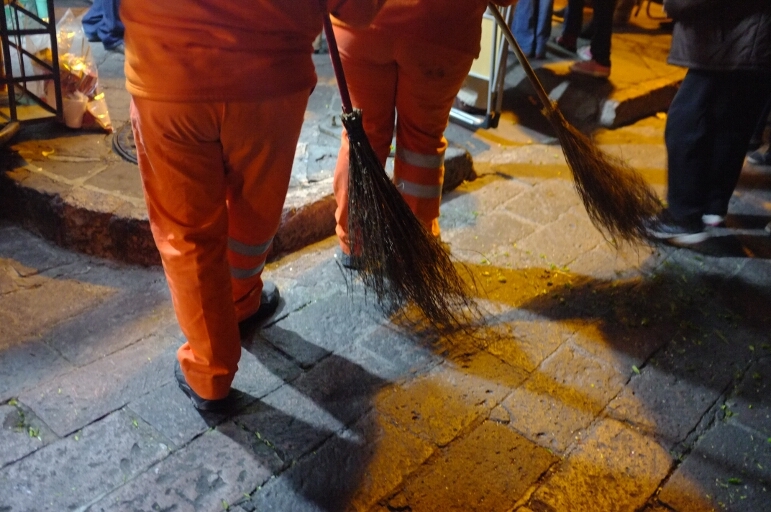 Brooms hand-made from branches are a common sight in Mexico. They work well too. I was taken to the market. All food enters the city here. The highest we can go. Anyone have a rope? I was worried about feeling homesick spending Christmas far from home. Thanks to Arturo and his family, I did not feel homesick at all. Sorry friends and family back home! I did miss you though! 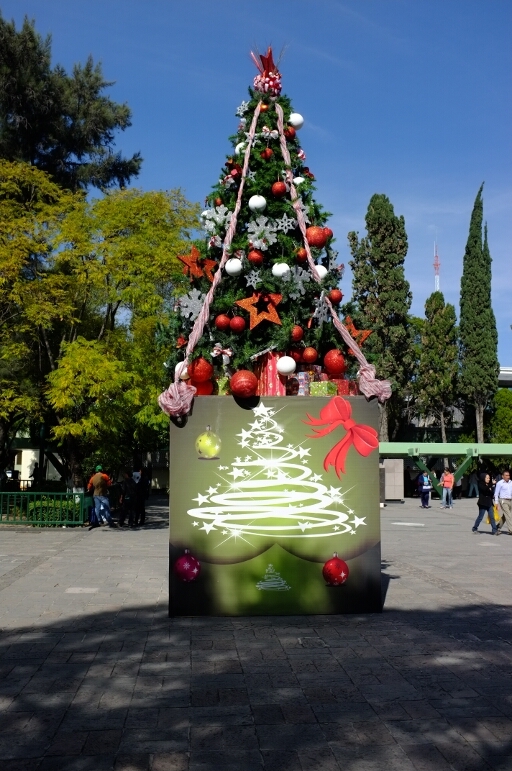 I enjoyed my time with them so much, I elected to take a bus into Mexico City so that I could spend an extra two days with them and still meet Felix for Christmas. Taking a bus is a huge deal to me. 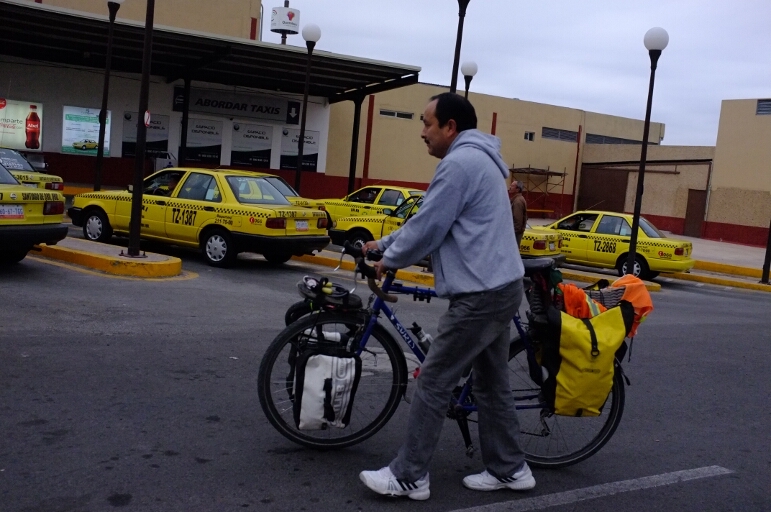 Saying, “Todo en bici,” is no longer entirely true. Oh well. 5,000 miles is still 5,000 miles. I missed ur writing!! Im glad u r feeling better! Im sooo grateful u have found a host family for ALL of the important aspects of ur adventure.